Keeping your lawn healthy takes a little more than just a quick run round with the mower every now and again... Grass is like any other plant which grows by having its ends cut. This is something the experts who provide our lawn care in London are very well aware of. 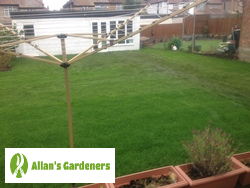 Unlike other lawn care services, when you use Allan's Gardeners you're getting work from properly trained and reliable specialists - not just some guy with a mower. You choose the time that's right for you out of our wide array of available options - we work seven days a week, including weekends, so we can fit in around any schedule. Gardeners experienced in lawn aeration, overseeding, re-seeding, lawn repair, and much more! 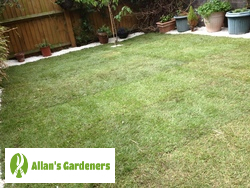 Guaranteed results - perfectly even lawn edging and healthy grass! How Do We Execute the Lawn Care Service? After calling and setting your most convenient appointment, you'll see your team of gardeners arrive promptly, fully equipped with the tools they need for the lawn mowing service needed. This is primarily our professional compact mowers, which run on petrol rather than electricity, so we don't need a mains supply. Your gardeners will assess the condition of your lawn and discuss your needs with you. This means that not only will you be fully informed regarding price and the amount of hours your grass cutting service are going to take, but also that you'll be able to give the team any further details that they might need. If you agree to the quoted price we'll be able to get started right away, as we'll have all the necessary tools in hand. We know that inviting someone onto your property can be stressful. That's why our expert lawn mowing services in London are delivered by an experienced team, all of whom have been carefully selected before they join us. Careful selection of the most effective equipment on the market means that we can help with a wide range of lawn repair and maintenance tasks - if you have any further questions, ask the gardening team or call our customer care representatives! Pick up the phone and dial 020 3746 3128 to get chatting with a member of our friendly advisory team right away. Alternatively, why not use our booking form or chat facility to send us all of the information about how you want your appointment to be set up. We usually send a team of two gardeners to your property - these professionals will be able to confirm your quoted price on site, and make sure they're fully aware of everything you need from us before starting your work. Call us anytime - we're standing by 24 hours a day!